tissue donors. Raise your voice with silicone wristbands customized at AmazingWristbands.com—a leading provider of custom silicone products. Every year, National Donate Life Month is celebrated in April. Donate life organizations across the country organize local, regional and national activities to help encourage people to register as organ, eye and tissue donors. The pinwheel was selected as this year’s official symbol. Why pinwheel? Because it represents a concept turning obstacles into opportunities. The artwork has four sails supported by one stem which reminds us that we have the potential to turn calamities into a new life. Do you want to donate your organs after you die? If the answer is yes, this would be one of the most selfless things you can do in your lifetime. You can save someone’s life. One organ donor can save up to eight lives. As a donor, you are helping restore the sight of someone struggling with vision impairment. Tissue donors can save or improve up to 50 lives. Even though there are donors, people are still struggling with acute shortage of organs for transplantation. At least 15 patients die every day waiting for a transplant and every 10 minutes a new name is added to the waiting list. Increased awareness of organ donation is therefore the only way out of this depressing scenario. This April, you can make a difference, too. Social media is a popular and convenient way to share the news. Inspire others to sign up for a donor registry by sharing information on Facebook or Twitter. If you — or someone you know — were an organ recipient, share your story. Support awareness by adding a pinwheel to your profile picture. National Donate Life Month is an excellent opportunity to have a discussion with your family members, colleagues and friends. Explain the importance of organ donation. The first and most important thing you can do is to tell your family members about your intention of becoming a donor. This will help them carry out your wishes much easier. Sign up in your state donor registry. Create awareness by wearing green — the recognized awareness colors for organ donation. Wear green ties, shoes, scarves or sunglasses. Decorate your office desk with awareness color balloons to promote the need for organ, tissue, and blood donation. Organize a registration table at your church or community gathering place. Join hands with local hospitals, donor families, recipients and donation advocates to spread the word and celebrate generous donors worldwide. Hold a local competition with rewards. Use customized items as a token of appreciation. 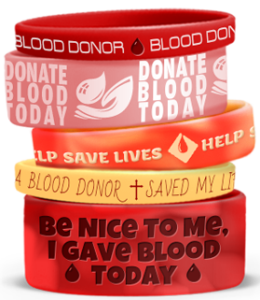 Customizable wristbands are a great way to remind people of this invaluable service—they can be imprinted with awareness messages such as “Donate Organ — Save a Life” or “Live Goes On.” They can also be imprinted with a pinwheel. Wristbands are available in various colors, fonts, sizes and styles such as debossed, ink filled debossed, embossed, color filled emboss, and screen printed. In addition to standard wristbands, you will also find thin, wide, extra wide, slap bands, adjustable bands, LED wristbands and USB flash drive bracelets. Here, you get high quality 100% latex-free silicone products which are comfortable and do not cause irritation. They are durable and long-lasting. Moreover, our products are available at very affordable prices. If you purchase in bulk, you will get discounts. Our 24x7 professionally qualified and friendly customer-oriented staff will help you design your wristbands exactly the way you need them. Numerous colors and color combinations to choose from. Most orders take 5 – 7 business days. Ultra-convenient rush orders, which can get to you in as little as 24 hours! Our toll-free number for sales, service, and support is 1-800-269-0910.